V.I. Surikov is one of the most ingenious artists of Russian and World Art. Surikov lived the most part of his life in Moscow, but considered his house in Krasnoyarsk to be the only home. 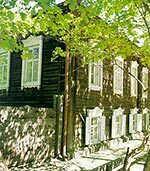 In 1948, to celebrate Surikov's 100th anniversary, his museum was established. In 1983 the museum received the status of V.I. Surikov House-Museum. In this house Surikov spent his childhood and youth, here he made the first drawings. The manor dependencies were restored, inside the house the ground floor primeval appointments have been preserved, now his works are kept on the second floor where there was a workshop of the artist. Everybody knows Surikov's masterpieces: "Capture of Snow Town", "Boyarynya Morozova", "Ermak's Conquest of Siberia", " Morning of the Streltsy Execution", "Menshikov in Beresov", "Suvorov's March through the Alps" and others. On the second floor there is artist's workshop where the "Capture of Snow Town" was painted; the household conditions are restored on the first floor. Daughters of V.I. Surikov took part in creation of museum. The collection of museum began with eleven works - today there are ninety works of the great artist. The works, stored in a museum, reflect all periods of life of Vasily Ivanovich Surikov and almost all sides of his creativity. The most part of works, Surikov's personal things and documents and photos were received from the artist's heirs. The museum has works of the earliest period - the childhood and youth. These are sketches of landscapes and copies from reproductions of the Russian artists. Works of student's years are presented by the "Siberian Album" 1873 and the academic drawings. Portraits of the artist, his relatives - mother, sisters, brother, wife and daughters are of special interest. The large paintings of the artist are in museums of Moscow and Saint Petersburg. In the museum they are presented by preparatory etudes. Surikovs' manor is a typical Siberian manor of the XIX century. There is an outhouse constructed in the beginning of 20th century by Alexander Ivanovich, the brother of the artist . A stable with barns and a bathhouse were restored. The manor is enclosed with wooden fence.